Charles Le Brun (1619–1690), The Sacrifice of Polyxena (1647), oil on canvas, 177.8 x 131.4 cm, Metropolitan Museum of Art, New York, NY. Wikimedia Commons. With Ajax dead, after falling on his sword, Ovid jumps to the end of the Trojan War, as Ulysses is setting sail to fetch the arrows of Hercules, which swiftly bring the fighting to a conclusion. He makes no mention of the famous Trojan Horse, though. As the Greek ships prepared to depart, Hecuba, Priam’s widow, was the last to board. We are then told that her youngest son, Polydorus, was secretly in the care of King Polymestor in Thrace, who was paid a great sum to protect him. With Troy destroyed and that source of income lost, Polymestor slit the child’s throat, and threw his body into the sea. as when his sword once threatened Agamemnon. of all my worth interred with my bones? of dead Achilles.” Fiercely so he spoke. As with Iphigenia’s sacrifice ten years before, it was now the turn of Hecuba’s daughter Polyxena to be sacrificed to secure good weather. Polyxena was taken from the arms of her mother, whom she was comforting, and put before the altar where Neoptolemus, the son of Achilles, was standing ready with his knife. Polyxena pleaded eloquently for her body to be given to her mother without the requirement of a ransom. Her speech even brought the priest to tears. Neverthless, he thrust the knife into her breast, and she fell to her knees, still resolute, but dead. The Trojan women mourned her, and cared for her body, so that her mother could embrace her in final farewell. Hecuba responded with a long speech of lament. the sightless sockets of his bleeding face! a name suggested by her hideous change. ran howling dismally in Thracian fields. Hecuba was transformed into a dog, and the place named Cynossema, the dog’s tomb. I will pass as quickly through the fall of Troy as Ovid does, before dwelling on the detail of Polyxena and Hecuba. 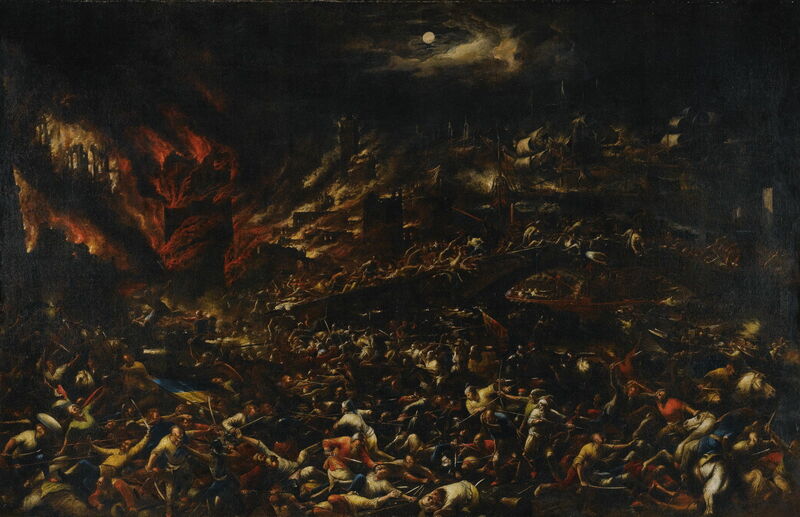 There are many paintings showing the sacking and destruction of Troy, of which my favourite, for its truly apocalyptic vision, is this, attributed to Gillis van Valckenborch. The story of Astyanax is a relatively recent invention. I have examined its history and depiction in art in this article, concluding that it developed after 700 BCE. 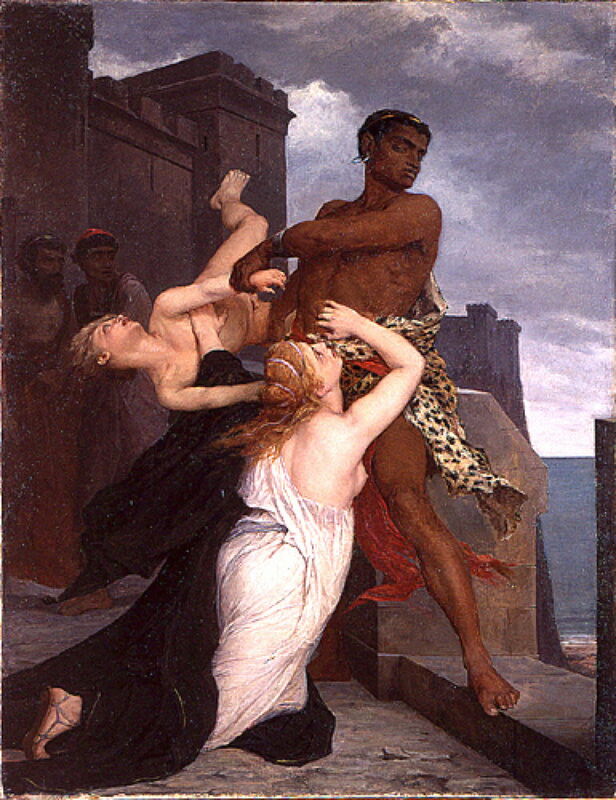 The clearest narrative painting showing this is Edouard-Théophile Blanchard’s winning entry for the Prix de Rome in 1868, The Death of Astyanax. It breaks convention in depicting Neoptolemus, the vicious son of Achilles, as a North African. Given that Achilles was the king of Thessaly, in central Greece, this seems a stretch of the imagination. Merry-Joseph Blondel (France, Paris, 1781-1853), Hecuba and Polyxena (after 1814), oil on canvas, 204.6 x 146.2 cm, Los Angeles County Museum of Art, Los Angeles, CA. Wikimedia Commons. 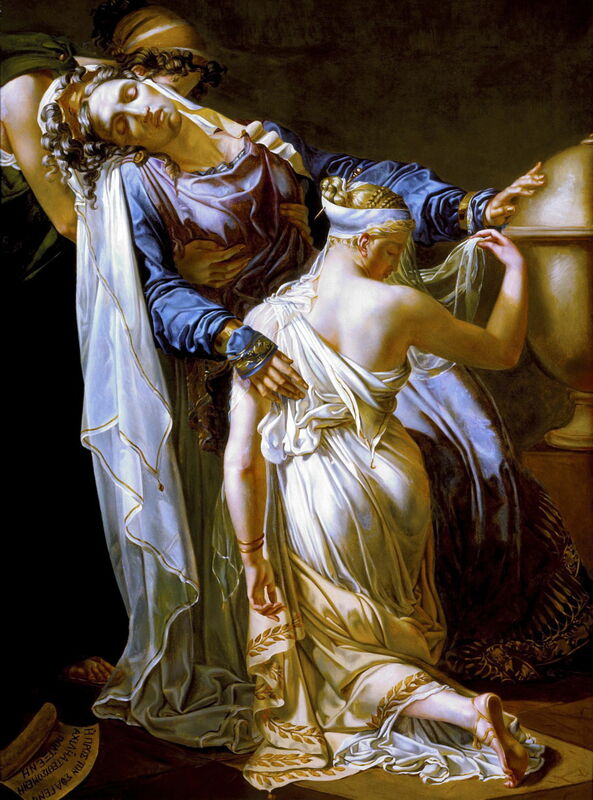 Merry-Joseph Blondel’s fine painting of Hecuba and Polyxena, from after 1814, is superb in its treatment of fabrics, but more puzzling in its narrative. Hecuba, the older woman, appears to have fainted, presumably at the announcement of Polyxena’s imminent sacrifice, with her daughter kneeling at her feet. 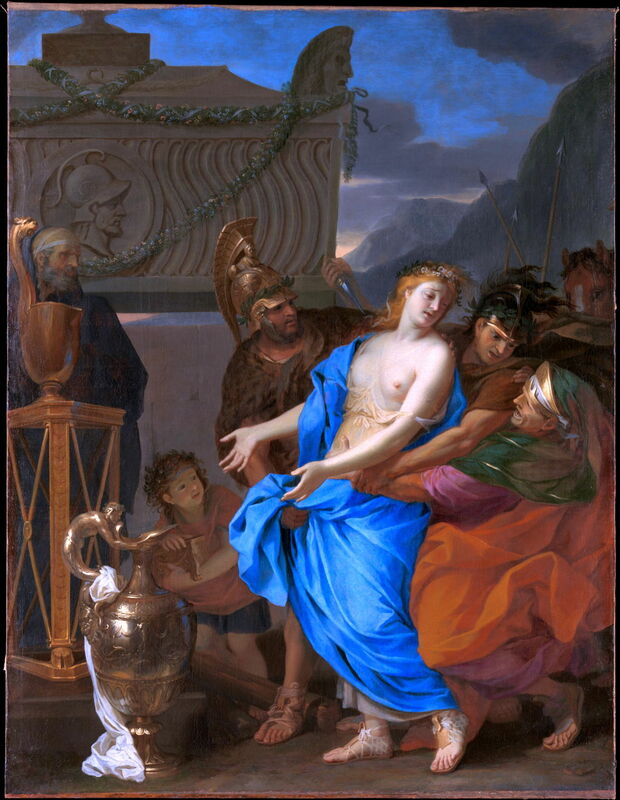 Several paintings show the sacrifice of Polyxena, of which Charles Le Brun’s from 1647 is arguably the finest, and in superb condition. Polyxena is being led to the altar as Hecuba tries to hold her back. Behind Polyxena is the same Neoptolemus who threw Astyanax to his death, threatening to kill her where she is. 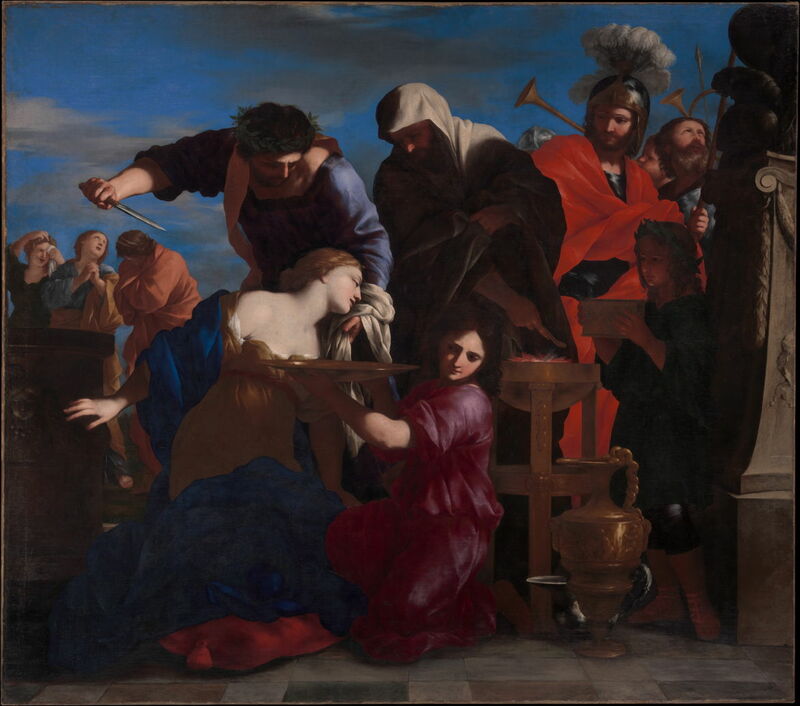 Giovanni Francesco Romanelli (1610–1662), The Sacrifice of Polyxena (date not known), oil on canvas, 197.5 x 223.5 cm, Metropolitan Museum of Art, New York, NY. Wikimedia Commons. Giovanni Francesco Romanelli’s The Sacrifice of Polyxena, from about the same time, shows the moment that the priest is about to sink his knife into the woman’s breast. A young assistant, their head averted, kneels ready with a large bowl to catch the sacrificial blood. 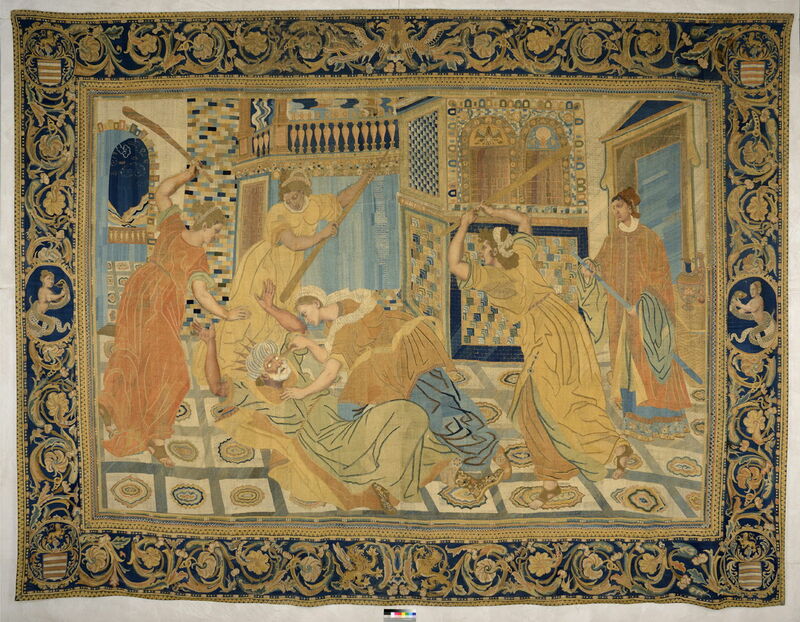 Artist not known, The Vengeance of Hecuba (1600s), Macao tapestry, silk embroidery, gold thread, and painted satin, 369.5 x 489 cm, Musée des Beaux-Arts, Lyon, France. Wikimedia Commons. The Vengeance of Hecuba is a magnificent Macao tapestry from the seventeenth century, showing Hecuba and three other women sealing Polymestor’s fate for his murder of Polydorus. Hecuba is poking his eyes out, as the others swing long wooden clubs at him. Giuseppe Crespi (1665–1747), Hecuba kills Polymestor (date not known), oil, 173 x 184 cm, Koninklijke Musea voor Schone Kunsten van België / Musées Royaux des Beaux Arts de Belgique, Brussels, Belgium. Wikimedia Commons. 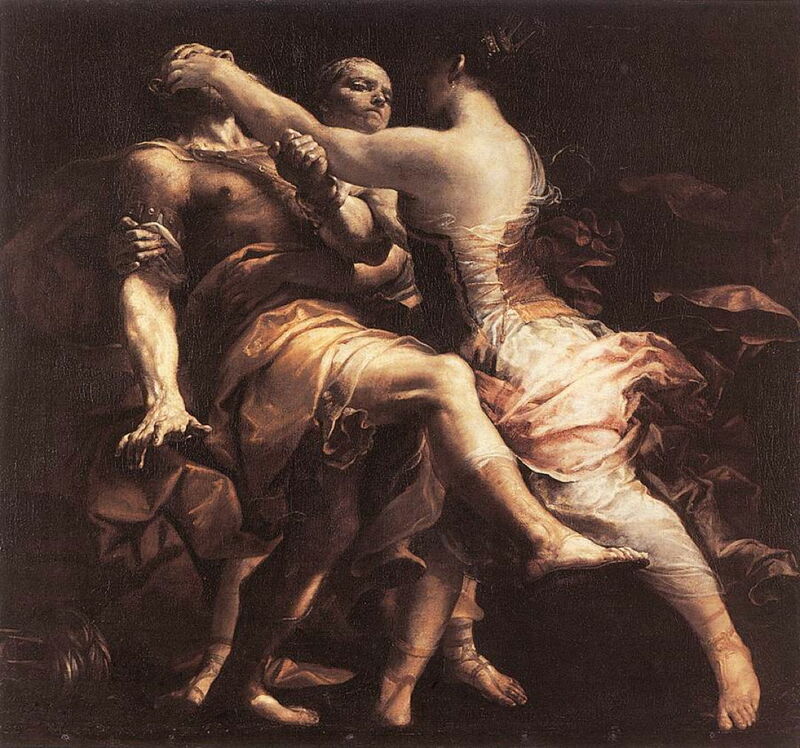 Giuseppe Crespi probably painted his version of Hecuba kills Polymestor in the early eighteenth century. His skilful composition makes it a chilling but carefully implicit image, as a woman associate holds the king down, and Hecuba reaches up to remove his eyes. Crespi has minimised the amount of limb visible in the upper part of the painting, to keep the composition there clean and clear. He seems to have compensated for that in the legs of the lower half, which are made even more complex by deep shadow. I’m disappointed that Artemisia Gentileschi doesn’t appear to have painted Hecuba and Polymestor, a story which I am sure she would have painted to perfection. Posted in General, Language, Life, Painting and tagged Blanchard, Blondel, Bramer, Crespi, Le Brun, Metamorphoses, myth, narrative, Ovid, painting, Poussin, Romanelli, van Valckenborch. Bookmark the permalink.